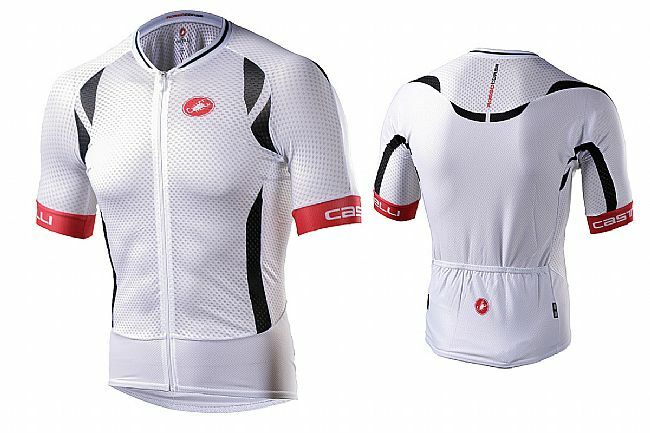 The Castelli Men's Climber's Short Sleeve Jersey is lighter and more aero than ever with the Climber's 2.0 version. It gains in speed by utilizing the same pattern as the incredibly sleek Aero Race 5.0 Jersey and fashioning it with ultra-lightweight Flusso 3D fabric on the front and shoulders to maximize ventilation and moisture-wicking. On the back, another featherweight fabric, Strada Pro 3D, is quick-drying and also provides support for the 3 jersey pockets. A full-length zip allows for additional ventilation, and mesh raw-edge arm grippers are thin and lie-flat for low-profile comfort. Claimed weight is 101 g. UPF 16 sun protection. Available in multiple colors.